In an unpretentious, though very com­fortable, apartment in the Rue de Pro­vence, Paris, lives Signor Sbriglia, one of the world’s famous vocal teachers, whose renown has been largely gained through his work with Mr. Jean de Reszke, the great Wagnerian tenor. Sbriglia is a student of the Naples Conservatoire, from thence making his début in the opera “Brasseur de Preston,” by Braci. 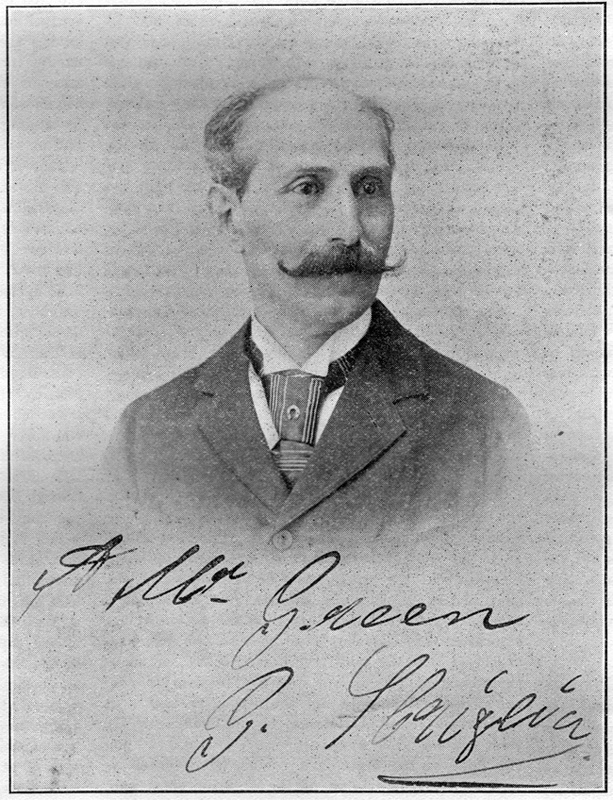 After some time in Naples he toured Europe, singing in all the grand-opera houses, and in 1866 went to Amer­ica, singing with the Italian and English Opera Company in the United States and Mexico. About twenty-five years ago he settled in Paris, devoting himself entirely to teaching. His first pupil he brought out in Paris was Otello Nonvelli, an Italian who made his debut in the tenor rôle in “Martha,” at the Italian Opera, which is now extinct, with Edouard de Reszke. His success was so great that Jean de Reszke, who was at that time singing baritone parts without success, being, in fact, so despondent that he contemplated leaving the stage, went to Sbriglia re­questing lessons. Sbriglia assured him that his voice was of the true tenor quality, and that he should give up bari­tone work. His study with the maestro covered about six years, and all the world can now testify to the accuracy of Sbriglia’s diagnosis. Shortly after, Josephine de Reszke, a sister of Jean and Edouard, came to him. She it was who created the principal role in Massenet’s opera, “Le Roi de Lahore,” at the Grand Opera in Paris. From Paris she went to Spain, where she had immense success. She left the stage to be married to Baron de Kronenberg; unfortunately she died in Poland a few years after her marriage, leaving two little children. Among his other celebrated pupils have been Lillian Nordica, Sibyl Sanderson, Fanchon Thompson; Miss Phebe Strakosch, soprano, daughter of the im­presario, Ferdinand Strakosch, and cousin of Adelina Patti, singing in Spain, Italy, London; Mr. Plançon; d’Aubigne; M. Castleman, now first tenor in the Opera at Algiers; and Madame Aduing, who sang at the Grand Opera, Paris, for five years, and also in Italy and London. After singing all the lyric operas, she devoted herself to Wagner. She enjoyed much favor as the soloist at the Colonne and Lamoureux concerts. Among his present pupils is a Miss Mark­ham, who has recently gone to Bayreuth to study Wagner rôles with M. Sem, a Swedish tenor; Mr. William Hughes, of Washington, D. C., a possessor of a magnificent basso cantante voice; Mr. Whitefield Martin, of New York, a tenor of much promise, who has given up a fine clientele of pupils to devote his time to study for the opera. No article would be complete without a mention of Madame Sbriglia, who, by the way, is an American, for she is a very important part of the studio. She it is who arranges all the pupils’ lesson-hours, attends to the financial part, and plays all the accompani­ments except for the exercises at the beginning of the lesson, which he industriously plays (?) with one finger. Madame takes great interest in all the pupils, is always ready to help in any way possible, and in many cases smoothes out the wrinkles that come from the master’s presence. She is a busy woman, for she must be on call, as it were, during the entire teaching-hours, which, however, are not so long as in former years, as he now refuses to teach more than five hours each daily. These hours being from 9 to 11.30 and 3 to 5.30, and the pupil who has not en­gaged lessons early in the season must be willing to take a lesson when some regular pupil is unable to come, and there are always plenty of pupils wait­ing to fill in a vacancy.—J. Edmond Skiff. You are reading Signor Sbriglia and Some of His Pupils. from the May, 1902 issue of The Etude Magazine. Outlets for Vocalists. is the next entry in The Etude.